I have tested a GTX 760 which barely hit 35 FPS on average in the lowest settings at 1080p. All the tests have been run in 1440p with the specs listed above, and using version 1.2.0. Interestingly, the Uplay client is smart enough to notify you if you are running an outdated version of your GPU drivers, which led me to install the latest game ready drivers (391.35). All the analysis comparison FPS images were conducted with the built-in benchmark, and run twice to ensure that the results are consistent. All settings have been set to Low when comparing the levels of a graphical setting. The graphical settings have been cut down to a scarce few options. Features like FXAA, Nvidia's fur textures (HairWorks) and ambient occlusion that were found in previous Far Cry titles are nowhere to be found since Far Cry Primal. 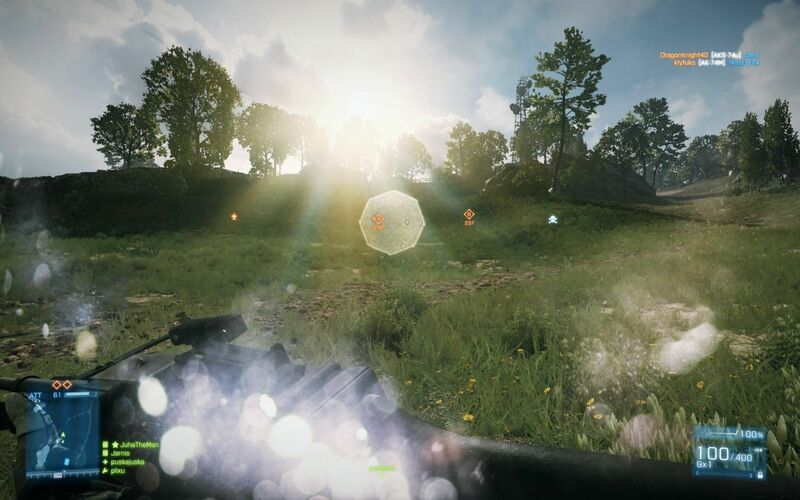 Something else I quickly noticed is that the, sometimes distracting, sun glare cannot be disabled. While it is not as bad as Battlefield 3, it certainly catches my attention when trying to look around. Hopefully Ubisoft adds the possibility to disable it with a future patch. Unlike Far Cry 4 getting changeable FOV support in a day-1 patch, Far Cry 5 features a FOV slider on launch. Though it can be tricky to locate with the option being found under Advanced settings as opposed to something more distinguishable. Like a few other modern titles restarting the game to apply new graphics settings is a thing of the past. They are applied directly without interrupting your gameplay. I have also noticed how it does not prompt you to save your changes in the Video settings, which for me is a nice gesture as wading through layers of menus can become tedious. In this section we are going to look at how each effect impacts frame rate and how each setting changes the visual style of the game. Be sure to check full resolution uncompressed PNGs if you are looking for pixel by pixel detail. The game has four presets, which saves delving into the meat of the options if you wish not to. For some reason this time no preset enables Anti-aliasing. According to the tool-tip available in the options menu, people running the recommend specs listed above should be able to use the High preset on 1080p, but your case may vary. This option controls texture filtering which I suspect uses Anisotropic filtering, the game does not specify the amount of samples, but since it is four options I suspect it ranges from 4x to 16x samples, though this is only an educated guess. Since it does not cause any performance hits on modern processors (see analysis below) I recommend turning it to at least High settings. The shadows quality can be controlled. While I have not seen noticeable improvement between High and Ultra settings, the difference between Medium and Low is easy to spot. I would recommend setting the shadows to at least Medium to avoid dots illustrating shadows. We could also use a draw distance slider as you can in some instances notice the shadows loading in as you move around, sure the draw distance is improved with each level, especially comparing Low to Ultra; but an independent option to control it would go a long way. Low settings, as you can imagine, does not do the game any justice in the visual fidelity department. I would advise setting it to at least Medium to eliminate most of the square-looking shadows. According to the tool tips in the options menu: adjust the graphical complexity of the world geometry and vegetation. But the truth is that this setting controls the draw distance, running on Low settings reveals the noticeable pop-in of many objects. I recommend setting this to at least Medium to minimize the pop-in textures. Since this setting controls the water texture and the separate Water graphical setting does not appear to make a noticeable difference we will be covering it here as well. Setting the option to Medium enables the awe-inspiring reflections in water, but not without cost in the form of a performance hit - see the graphs below. This setting improves the texture fidelity of the terrain you are close to and extends the draw distance for the terrain. The Low setting shows a lot of blurry terrain after a couple of meters, so switching it over to at least Medium makes the terrain more defined. This setting does not control the amount of fog, it controls the lightning effects being casted from the environment (including trees, etc). The name of the graphics setting could be misleading, the tool-tip in the options menu does not seem to explain this option properly and the comparison images does not show the real effect of the graphical setting. The game features a FOV slider, like every other game Ubisoft have released in the past years. Increasing the FOV from 70 to 95 degrees horizontal (personal preference) will result in a minor FPS drop, roughly about ~5 FPS in my case. For AA options we only have SMAA and TAA available, with only 1x sampling. In comparison to older titles it feels like we are lacking some options with Ubisoft's latest addition to the series. Enabling any AA only shaved off a couple of FPS at Low settings, but will always depend on your location. The comparison below is not shown in the source quality. See the original image as it's easier to spot the difference on each AA level. If you want AA enabled I would recommend SMAA as it provides the best quality and the least performance hit. There are separate sensitivity sliders for different usages, which is a bonus. Mouse Acceleration is disabled by default, and I have had an smooth experience not experiencing any mouse lag. The key binding is disappointing since you only can assign an action to one key. There is a preview image of the keys assigned, but since I have a Swedish keyboard these binds do not match, neither do the extra letters we have in the language match up, which shows that there could be improvements done. The audio settings are underwhelming due to a lack of independant sliders for music, sfx and voice. They are all mixed into one volume slider, except VoIP which has its own separate slider. So conclusion time! The draw distance for each level of all the graphical settings should be documented, the current tool tips feels really basic and do not contain enough information, neither are most of the preview images helpful. I have not suffered from any mouse lag, and mouse acceleration is disabled by default. The key binding can become problematic since you only can bind an action to one key, hopefully the developers can change this behavior. The graphics settings you will want to invest your performance on are the shadows and the vegetation quality. Both of these control draw distance of the majority of objects, and at least Medium provides a good trade off for performance / quality. Performance wise, the game is stable. In all my testing the game never crashed. Not even once, neither did I experience any major bugs / glitches, which shows that Ubisoft puts tremendous effort in order to ensure a good experience. This wont escape the high GPU usage, a GTX 760 will simply not hit 60 FPS on 1080p at Low settings, you will need a medium end system to truly benefit. Despite some of the aforementioned, this is still an incredibly solid addition to the Far Cry series and a PC version trend we would like to see continued, ideally improved!